I grew up loving cream of tomato soup with a grilled cheese sandwich on a nice rainy day in the often gray Buffalo. What a great comfort food. Of course, it was from a can that you would add water to or milk if you really wanted it creamy. The generic brands were the worst. Oh how far I have come. There are so many aspects to enjoy about this recipe. For starters, the ease. It is a few more cans and some dicing, but it is well worth it. You can make it with fresh tomatoes and herbs for just slightly more prep time. To stew the tomatoes, cut into chunks and cook over a medium heat for 20 minutes without adding any additional liquid. However, especially with the fresh herbs, it will really change the taste of the soup. It will become more vibrant. Secondly, it is a very sensual meal. I believe that we are more satisfied from our meals when we can attack more of our senses. Visually and texturally from the tomatoes and cream cheese we get beautiful colors and a unique combination of creaminess with tomato heartiness. The aroma just brings your sense alive. If you use fresh tomatoes and herbs it will come alive even more. Lastly, the taste will be the final test to win you over the recipe. The recipe can be altered to meet dietary needs as well. You can use the butter with the olive oil when sautéing the onions and garlic. This helps give additional flavor. Or just use the olive oil. You can add salt for additional flavor if sodium isn’t a concern in your diet. The cream cheese can be non- or low-fat which I would recommend over full fat to limit the fat and cholesterol obtained from animal products. The honey can be omitted if needed. It helps lessen the acidity of the tomatoes. Once you try the cream of tomato soup with the cream cheese, it will be hard, although nostalgic, to go back to anything else. In a saucepan, melt butter (opt) and add olive oil. Sauté onions add garlic until onions are soft and translucent. Add the herbs and pepper and sauté for a few more minutes, until the aromas of the herbs start to open. Add tomatoes, sherry and honey. Cover and simmer for about 30 minutes. Add the cream cheese and cook until melted. This tomato soup will be chunky. 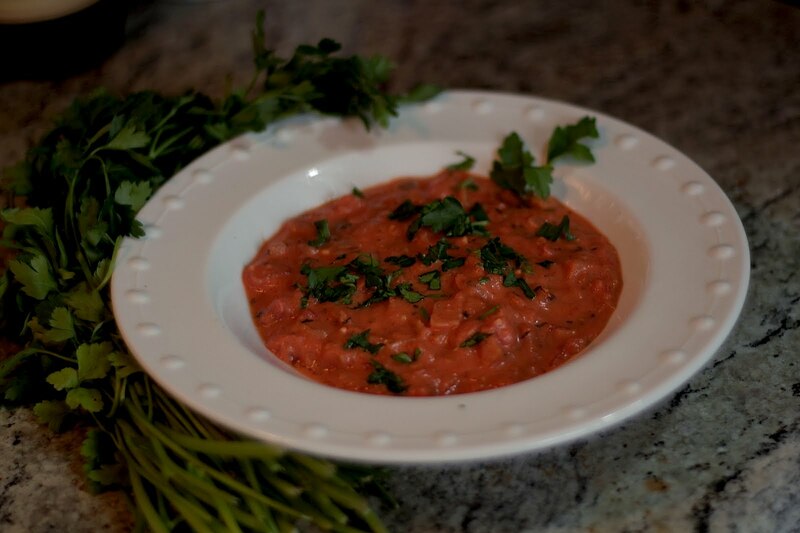 You can omit the diced tomatoes or put it in a blender if you prefer it smooth. Top with fresh chopped parsley. Serve with a crusty bread like ciabatta.